As I mentioned in my last post, the wonderful Robin and Karen nominated me for the Beautiful Blogger award. I’ve read The Lord of the Rings 11 times, long before it was “fashionable”. Probably the last reading was in early 2000. I love these books, so much so that I read a biography of J.R.R. Tolkien to find out more about the genesis of the works. Related to #1: I started reading TLOTR because I mistakenly thought my father liked the books. I found a box of his college things when I was a teenager and within it was the entire trilogy. Thinking that he liked the books, I read them and got hooked on Fantasy/Sci Fi ever since. Years later (think 20 years later), I mentioned this to my dad and he said that he never liked those books and could never get into them. Go figure! Why did he keep them all those years??? I am a terrible joke/story-teller. Really! Ask everyone I’ve ever known. If there ever was a biography written about me, it would be entitled, “Unintentionally Funny”. I am very particular about how my dishwasher is loaded. If anyone loads my dishwasher in what I consider a sub-optimal fashion, I will change it to my preferred loading style. I used to be an aggressive driver before I moved to NYC, but my driving now might best be described as Old Granny style. I rarely drive now and on the rare occasion that it is required, I am quite nervous about it. I white-knuckled it a couple of years ago from Napa to Sonoma over the mountains. I had a line of 15 cars behind me honking the entire way. I would have pulled over to let them pass, but there was nowhere to pull over. I sang from the age of about 12 until I was 34. Opera. I gave it up 8 yrs ago and haven’t sung a note since. Oh I’ve sung a lullaby or two in the years since I quit, but not what I consider real singing. As a matter of fact, my son asks me not to sing. I miss performing and the collaboration with other musicians. But I do NOT miss auditioning and being poor. My mother gave me my first voice lesson. I remember it clearly as if it just happened. I was in my jr high school choir and wanted to try out for one of the solos. I sang it for my mom and asked her how I could make it better. She suggested that I sing with vibrato. I don’t even think she knew the term vibrato, so she demonstrated it for me. That was the first time I used vibrato. I nailed the audition and I got the solo. My voice comes from my mom; she has a beautiful voice. At one point, I knew all the singing parts to Handel’s Messiah. And I mean all. Soprano, Mezzo-soprano, Tenor, and Baritone/Bass choral parts and all of the solo parts. I sang the Messiah every Christmas for years and sitting in on all those rehearsals can get tedious no matter how good the music. So I decided to keep it interesting and learned all the parts. I can’t say that I remember them all now, but it was fun learning them. I have never considered myself a creative person. Really. I thought singing wasn’t creative because as an opera singer, you are just singing music someone else has written; singing was a skill I could do. I can’t draw, not even stick figures. I can’t write fiction. 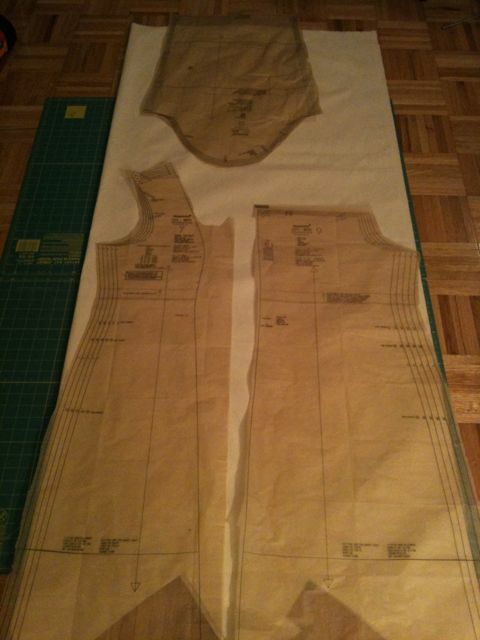 I sew from patterns; I’m not a designer. The first time I considered myself a creative person was when I started working with mosaics and created pieces from my own imagination. Phew! But now that that’s over, I have to nominate others. I have to admit there are too many people I would like to nominate, so I will cop out and nominate anyone reading this post or on my blog list. Sorry! And in sewing news… I have finally gotten off my arse and started my fall coat. See below for the evidence. I am sewing up the muslin tonight and will hopefully have muslin-y pictures to show you tomorrow.